Manchester hasn’t always had the best reputation when it comes to being a haven for tourists, but over the past few years Manchester has gained a reputation for being a cultural hub, attracting visitors from all around the world, making it the third most popular city for tourist visits in the whole of the UK. What was once the industrial heart of the country has now become the place to be to discover all that is great about Britain. The city has plenty of incredible museums that not only chart the history of the city but also map the transitioning social circumstances of the people that made the city such a vital part of the success of the nation throughout the centuries. At Manchester Museum you can discover all kinds of wonderful artefacts from prehistoric creatures that roamed the earth millennia ago through to hands on interactive exhibits and exotic treasures. The museum is located close to Manchester’s famous student village and is easy reached from anywhere in the city. The Northern part of the Imperial War Museum is located in Manchester and focuses on the marine defences of the country, with warships and artefacts relating to the maritime heritage of the nation, including pieces from both world wars it offers some truly atmospheric exhibitions and exhibits that can be both thought provoking and awe inspiring. There are many other great attractions where you can spend a few interesting hours and learn something at the same time, details of which can be picked up at any of the tourist information centres and public libraries. Manchester is a city with a rich theatre tradition and you will find theatres dotted all around the city from small and intimate venues to grand Victorian theatres than can seat thousands of people. The city hosts many different types of cultural events throughout the year so before you visit check with the city’s websites to see if there is anything happening that you could include in your itinerary. As well as theatre there is the ballet and the Opera House which offer some truly spectacular entertainments. No matter what your taste in stage or screen there will be something in the city for you to enjoy. Manchester is renowned for its exciting nightlife and the liveliest places to head in the city for a night on the town are the Oxford Road, Canal Street and Deansgate. The city is filled with cafes, bars and some truly incredible restaurants. Not forgetting the pub that holds the record for being the thinnest in the whole of the United Kingdom. If you love food then you will be spoiled for choice when it comes to elegant dining and fine foods. Take Michael Caines at Abode this double Michelin starred celebrity chef offers technically perfect food to delight the eyes and tantalise the taste buds. Manchester is just as famous for its opportunities for retail therapy as it is its industrial heritage. With fabulous purpose built shopping centres like the Trafford Centre where you can enjoy some undercover retail therapy with plenty of bars and cafes all there in the centre to offer some respite from the hundreds of stores, to the traditional outdoor markets like those on King Street, Market Street and St Anne’s Square. There are plenty of unusual and unique items to be found in Manchester’s Chinatown area and in some of the more traditional and long standing shopping centres like the Arndale centre. Manchester is home to two football teams, the supporters of which has divided the town between the reds (Manchester United) and the blues (Manchester City). This is a city that loves it’s football and the majority of the people that live in Manchester will have an opinion on which tem is the best. You can take a tour of one of the most famous football stadiums in the country, Old Trafford and get a sense of just how important football is to the city. Even if you have never followed the sport yourself you can’t fail to be impressed by the immensity of the stadium and the passion of the fans. Manchester is one of the few cities in the country where you can ride a tram to get to where you want to be in the city centre, which is something that you really have to do while you are here. Other than the trams there are plenty of excellent public transport links to get to where you want to be in the area and beyond. 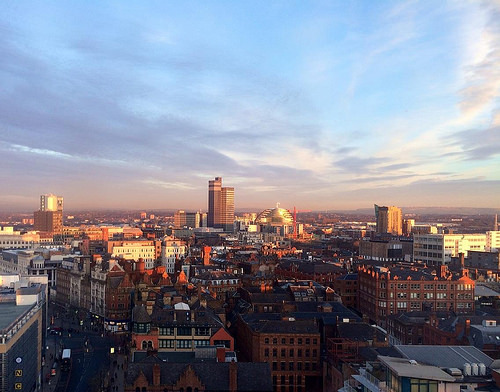 Manchester is really a city that has something for everyone whatever you are looking to get from your time here, whether it is culture, history, excitement or good food, Manchester has plenty of it to share with everyone that comes to the city.